The Bank of Canada has unveiled a commemorative $10 banknote to mark the 150th anniversary of Confederation. It's only the fourth time in Canada's history that it has created a commemorative banknote. There will be 40 million notes printed. The bank says they will enter circulation on June 1. 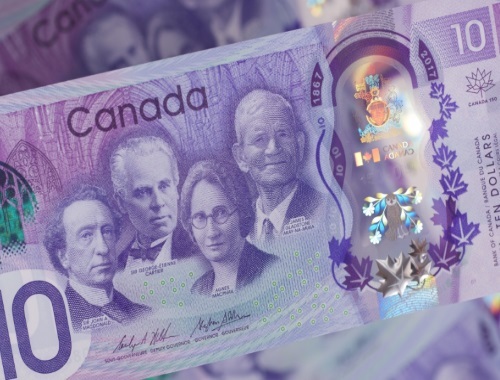 The front of the bill features portraits of Canada's first prime minister, Sir John A. Macdonald, and fellow Father of Confederation Sir George-Étienne Cartier, Canada's first female member of Parliament, Agnes MacPhail, and James Gladstone, Canada's first Indigenous senator. The back of the bill features landscapes including the Lions and Capilano Lake from British Columbia, fields of Prairie wheat, the Canadian Shield as seen in Quebec and the northern lights as they would be seen in Wood Buffalo National Park.